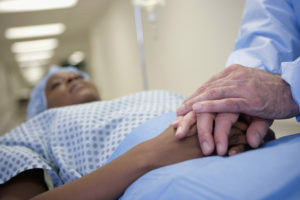 It’s a puzzle with answers that have long eluded researchers: African American women are more likely to have a more aggressive form of endometrial cancer and more than twice as likely to die from it than white women, according to the American Cancer Society. Endometrial cancer, a common form of uterine cancer, has an 80 percent rate of survival over a five-year period for most women diagnosed at age 60 and above, according to the National Cancer Institute. This year, the American Cancer Society projects 61,380 women will be diagnosed with the disease and 10,920 will die from it. It typically begins as a tumor in the innermost layer of the uterus, and can spread to other organs like the bowel and bladder. African American women are more likely to have more aggressive tumor types and a cancer that progresses to an advanced stage, putting them at higher risk for negative outcomes. A study published in September 2015 by the American Association for Cancer Research showed that black women were 80 percent more likely to die from endometrial cancer after diagnosis than white women, “one of the greatest seen among common cancers,” the study reads. Why this group is at a higher risk is unclear. 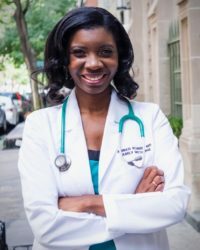 Ebony Hoskins, a gynecologic oncologist in Maryland at Women’s Health Specialists Clinic thinks it goes beyond access. Two years ago, Ruth Scarbrough, who is African American, was diagnosed with advanced endometrial cancer. “I was having discharge and thought maybe it was a yeast infection,” said Scarbrough, who was 69 when she noticed the symptoms. That was followed by abnormal bleeding, a common clue that something more serious was going on. Doctors used an ultrasound and biopsy to study at the lining of the uterus, also called the endometrium. Weeks later, she was diagnosed with advanced endometrial cancer. Unlike other cancers, there is currently no way to prevent or screen for endometrial cancer, although awareness of risk factors may improve the likelihood of early detection. Researchers have targeted other risk factors, such as not having children, taking estrogen hormone therapy and obesity. Taking birth control and having children may help lower the risk, but it does not completely prevent the cancer. Scarbrough’s treatment included a hysterectomy, chemotherapy and radiation treatment. “I pushed myself to continue to live my life the way I had been living,” Scarbrough said. “I felt that [having endometrial cancer treatment] was not a death sentence that I would have to stop everything and wait for this to pass by.” Two years later, Scarbrough is cancer-free and advocates for other women with the disease. Scarbrough’s story is not uncommon for African Americans with endometrial cancer. She was fortunate to survive, but many African American women are not. Last year, the PBS NewsHour’s Gwen Ifill died from complications of the disease. At the Johns Hopkins Kimmel Cancer Center, researchers have been conducting small clinical trials of immunotherapy as a possible treatment for endometrial cancer, according to Deborah Armstrong, who directs the hospital’s medical gynecologic oncology clinical service. The effectiveness of a immunotherapy drug called pembrolizumab (marketed as Keytruda) which was first tested to treat colorectal cancer is now being studied to treat endometrial cancer. The drug can identify specific cell markers in the cancer tumors and then help destroy them. But mroe research is needed to determine its effectiveness as a treatment for these kinds of cancers. “Does that mean someone whose cancer progressed after surgery should use it? Could [someone] potentially avoid chemotherapy?… Those are answers we do not have,” Armstrong said. The FDA has recently granted accelerated approval for the drug. Members of PBS NewsHour’s staff recently participated in a charity ride benefiting endometrial cancer research at Johns Hopkins University’s Kimmel Cancer Center in memory of Gwen Ifill.